Granite furniture is hardy and naturally beautiful. Both marble and granite can be used to make furniture. You can display flower arrangements, photos of your family or pets, clocks, antiques, antique pottery, you name it. We also make pedestals to support table tops such as office desks or conference tables. Tables that are made of natural stone with pedestals to match look outstanding in any office. Choose from virtually any color. 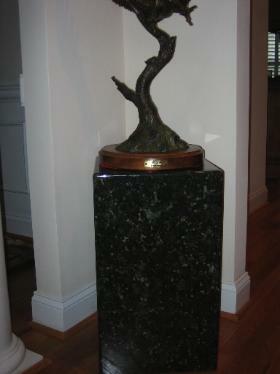 Pedestals can match your decor or stand out as a piece of art itself. 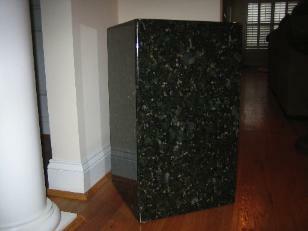 We make custom marble and granite pedestals, meaning any color, size or style. Three or four sided pedestals with round tops, triangular or square tops. 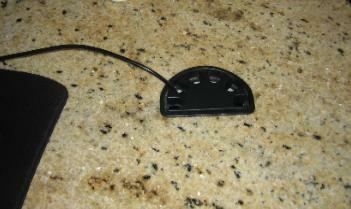 We also fabricate counter tops for commercial buildings. Hotel front desks, doctors offices and offices in general. Please contact us by phone or email us and we'll help you with your ideas and hopefully come up with some new ideas that you hadn't even thought of! Natural stone furniture can be used indoors and outdoors. Beautiful natural granite tables of any size are easily maintained outside. Use stone tables on your patio around the pool or on your deck. We can make your table so that you're able to use an outdoor umbrella with it; place it in the center just like other patio tables. Beautiful natural granite tables of any size are easily maintained outside. Below is a picture of my desk at home. Granite pedestals for an office desk are great, we made a grommet for the electrical wires so they are hidden and stay out of the way. 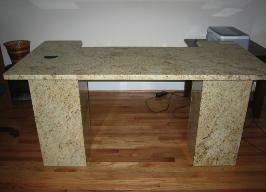 Granite furniture is easy to clean and looks magnificent in any room.